Heat oil in a large stock pot. Add carrots, celery, onion, garlic, ginger, curry powder and turmeric. Saute for 3-4 minutes until onion is translucent and curry is fragrant. Add cauliflower, potato, carrots, celery and stock. Bring to a boil, then reduce heat and cook covered, on low heat for 20-25 minutes until vegetables are soft. 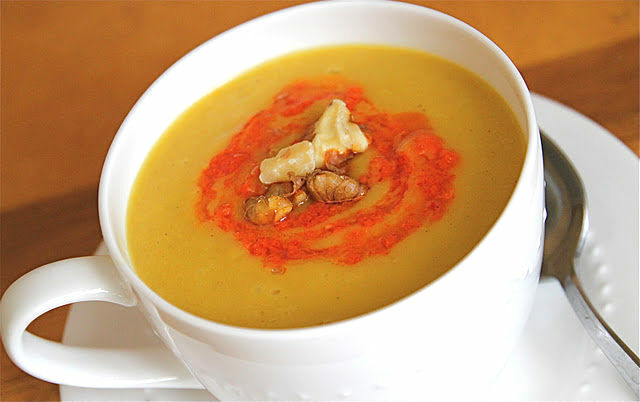 Blend in a blender or use a stick blender to puree soup. This is a soup made with anti-cancer ingredients that I made for a friend battling breast cancer. See JeanettesHealthyLiving.com for more recipes I've made for friends with cancer.